According to the Bureau of Labor Statistics, there are more than 42,400 “struck by falling object” OSHA recordable incidents every year in the United States. By our estimate, that’s nearly 116 injuries caused by falling objects every day or one injury caused by a dropped object every 10 minutes. And this only accounts for OSHA recordable incidents; it does not take into account accidents from fallen objects that go unreported. Many heavy manufacturing organizations have deployed fall protection programs for workers, but many of these same organizations have not deployed a thoughtful drop prevention program for tools and equipment. Expanding a fall protection program to include tools and equipment is a good starting point for companies and employees to implement an active fall protection for tools program and expand on the mission to encourage an inclusive culture of safety. For example, a tool weighing only eight pounds falling from a height of 200 feet will travel at a speed of approximately 80 miles per hour and can have an impact force of 5,540 lbs. when it impacts the ground. Resulting from this impact, safety nets and drop zones are of little benefit when an object of mass and speed makes a direct impact or deflects off of another object. Download our handy infographic for important information and statistics about falling tool incidents. Falling objects are such a concern throughout the world and in all types of industries that it was even the focus of World Steel Association’s World Steel Safety Day for 2017 and continues to be one of the top five causes of injury, which means it still should be top of mind and a priority when it comes to protecting your worksite. A dropped wrench, hammer or even a walkie-talkie can be extremely damaging to your fellow workers engaged in heavy manufacturing, transportation, metal working. It can be even worse for heavier tools that are frequently used in these or other types of industries. “Our industry already does a great job of stopping people from falling with a proven method called Fall Protection. For some reason, the current defenses against falling tools are really “back-up” systems like toe boards, tool nets, and hard hats, instead of a plan to stop objects from dropping in the first place,” says Craig Firl, Technical Service Specialist for Fall Protection for at 3M. Have you conducted a safety audit of your worksite and evaluated solutions that can help prevent these types of accidents? If yes, ensure that regular checks are in place to remove or secure objects in risk areas. If no, consider conducting your preliminary audit today. We’ve created a helpful interactive checklist to help you get started. There are solutions available that can help you prevent serious accidents while also helping you preserve expensive tools and equipment, and maintain employee productivity. A key factor is to know what you are trying to protect and to select the proper equipment to help you complete that task. There are a wide range of products available to meet a variety of tool sizes and weight applications. Even tools such as a 45-pound rivet buster or 80-pound portable generator can be protected from potential falling hazards. It is the responsibility of every safety manager, construction superintendent, supervisor and worker to make sure they understand the dangers they face when working-at-height. Start by creating complete fall protection plans and ensuring that workers on and off the ground are safe. You should conduct an audit of your work site by using a checklist designed to help make you aware of potential hazards resulting from falling tool situations. We encourage you to use our interactive checklist to help you get started. The primary system to prevent tools and equipment from falling is tethering tools and equipment with connectors, connection points, and anchors. Many tools today have built-in connection points affixed by the manufacturer for tethering. Tools and other equipment can also be retrofitted with connection points. These tools are then connected to an attachment point via a tethering device. Tools either can be connected to a worker through a tool belt, harness or wristband, or anchored to a fixed structure. These solutions not only apply to small hand tools, but also can be used for tools and equipment that weigh up to 80 pounds, such as rivet busters, portable generators, etc. Tools that weigh more than five pounds should never be tied-off to a person. If a heavy object gets loose, the weight and force of the falling object could dislocate a wrist or shoulder or even pull a worker over a ledge or from scaffolding. If a worker has a tool attached to them and needs to pass it off to a colleague, that colleague can connect to the tool before the passing worker disconnects from it, ensuring the tool is 100 percent tied off and never has the opportunity to become a drop hazard. For smaller items such as screws and nails, there are many buckets, bags and pouches with closure systems to significantly reduce the likelihood of these small but dangerous items from falling out. Employees should be properly trained on how to use tethered tools. They must be taught how to attach a connection point to the tools, use the lanyards properly and respect the weight rating of the lanyards. A positive first step toward implementing fall protection for tools into your current safety plan is to enlist a third-party specialist and create a dropped object prevention plan that is site and or application specific. If you are a supervisor of authorized users who implement and monitor a managed fall protection program, you might consider becoming a dropped object prevention competent person. 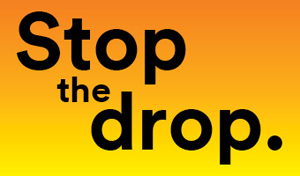 Are you ready to #StoptheDrop? Publisher’s Note: This post was first published in July of 2017. Minor updates to the content have been made since for readability.